yesterday, my husband and i took my parents to a unagi, freshwater eel, restaurant for my father’s 65th birthday. it was a humble request from my dad to go to a unagi place, because unagi can be a bit expensive for an ordinary middle class family. my dad loves una-ju (うな重）, which is filets of char-grilled unagi marinated in special soy sauce-based sauce, placed on top of freshly cooked japanese rice, served in a beautiful lacquered-ware box. 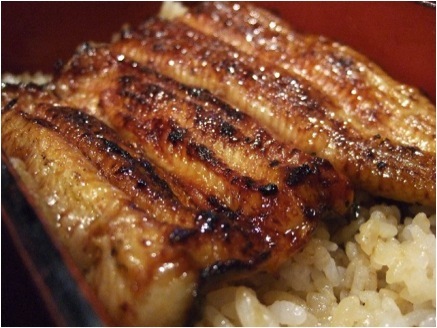 the combination of the charcoal aroma on the crispy surface of unagi filets, their texture being so soft inside, the thick, almost pasty savoury sweet sauce on top of fresh shining white rice gives an amazing joy to all of your five senses. while indulging ourselves to the luxurious unagi meal, our conversation drifted back to our childhood. 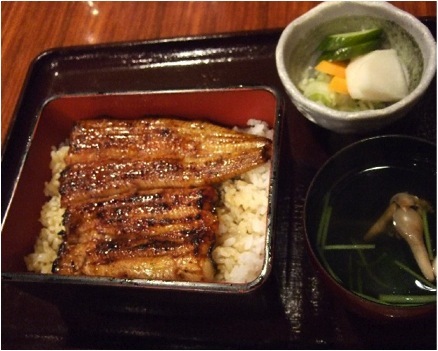 when i was growing up, we used to frequently eat una-ju at home, which were delivered from a neighbourhood unagi restaurant. my father used to own a small pharmaceutical business back then, which was quite lucrative at that time and hence we never had to worry about money. whenever we felt like it, we simply made a phone call and the una-ju boxes were delivered at our front door in half an hour. my father, a unagi lover already back then and super busy business man, stuffed only the filets of unagi in his mouth, leaving like a wind, handing over the juicy, sauce-soaked rice to my baby sister (who happened to love the rice bit, rather than the filet bit). una-ju was part of the list of our regular menu, and i shamefully admit that i had never specifically appreciated how lucky we were at that time. things drastically changed after the japanese bubble economy burst in the early 90’s, and my father had to fold his business completely. we literally lost everything – our home, our lifestyle, many friends, contacts with some relatives – left our suburban hometown and started all over our new life from scratch in a mega urban city. my sister and i have moved on, finished our education with a help of some money my parents managed to secure for us, our dear aunties and some scholarship, found our own jobs and started our own family. my parents, ever since we left our hometown, have been leading a quiet and very modest life. my parents are still not retiring, at the age of 65 for my dad, and 60 for my mom, as they do not have much savings to support themselves, and their pension is still very minimal. however, as we ate unagi yesterday, they looked so much fulfilled in life, especially compared to how they used to be 20 years go. my dad appreciated every bite of his unagi plate, not like how he used to swallow it in a rush, leaving the rest of us at the dining table to attend to some business matter elsewhere. they may not be as affluent as they used to be, but i could see that the contentment was in abundance. the unagi yesterday pulled out our past memories, brought us smiles, and made us happy. the sad incidents have now become a memory, and now we can move on.